"Delicious Italian skillet dish with prosciutto ham, fontina cheese (one of Italy's best cheeses) AND a white wine/mushroom sauce. Who could ask for more? Here's the recipe YOU asked for!" Lightly flour chicken breasts, shaking off excess flour. In a large skillet over low heat, melt butter/margarine. Add chicken and saute until lightly browned, about 2 minutes each side. Remove with slotted spatula and set aside. Increase heat to medium low. Add mushrooms and saute until juices are rendered, about 4 minutes. Add wine and simmer until reduced by 1/4, about 3 to 4 minutes. Increase heat to medium high. Add stock, parsley and pepper and simmer until sauce reduced to 1 cup, about 10 minutes. Reduce heat to low. 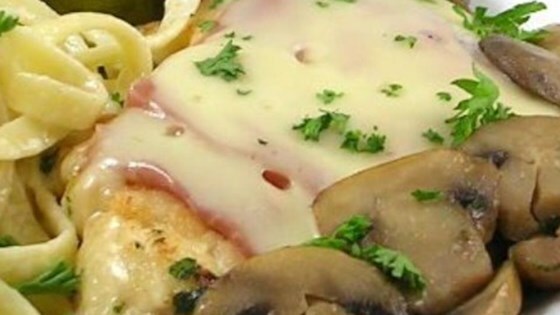 Top each chicken breast with a slice of prosciutto and a slice of fontina cheese. Return chicken to skillet and cook just until cheese melts. Transfer chicken to individual plates and top each with some of the mushroom sauce before serving. Easy to prepare and great flavor. I didn't have the fontina so I used mozzarella. I served it with garlic mashed potatoes.